The Resonant frequency condition arises in the series circuit when the inductive reactance is equal to the capacitive reactance. 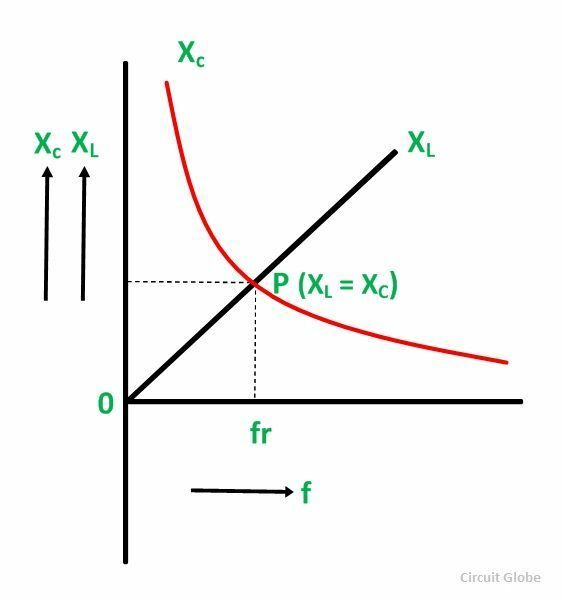 If the supply frequency is changed the value of XL = 2πfL and XC = 1/2πfC is also changed. When the frequency increases, the value of XL increases, whereas the value of XC decreases. Similarly, when the frequency decreases, the value of XL decreases and the value of XC increases. Thus to obtain the condition of series Resonance, the frequency is adjusted to fr, point P as shown in the curve below. At point P when (XL = XC) the resonant frequency condition is obtained. Where, fr is the resonant frequency in hertz when inductance L is measured in Henry and capacitance C in Farads.